The best RV Wax may not be a wax at all; see what the Expert says. Why the best wax for your RV may not be wax at all! For most of you, the quest for the best RV wax will start among traditional car care products. Then shortly along the way you will start to consider the possibility that specialized products must be made for the RV and boat trade due to the fact that RV's and boats are made of fiberglass and gel coat, not car paint. Your quest is most likely what brought you to this page looking for what might be considered the best wax for your RV, motor home, diesel pusher, etc., etc. After all, it does make sense that a special wax would exist for these special materials. Before long, you will find yourself more confused than ever due to the many forms of marketing and labeling that exist for these kinds of projects. 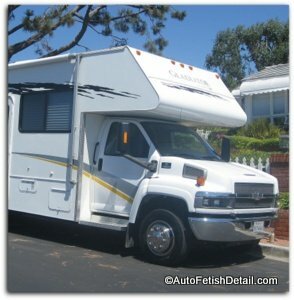 Does my RV really need to be waxed? Is there any truth behind these "Marine Grade" waxes? Darren, can you show us what you use professionally? Let's go through these and further questions so you not only become an informed consumer and RV owner, but you can actually go away with some working knowledge and a solution to what you are in search for. What Kind of RV are You Trying to Wax? Before I can help you find the top rated wax for RV's, you must first identify what type of material you are going to battle with! Yes, for some of you, this will mean a battle! Darren's Footnote: I receive many calls from frustrated RV owners in search of solutions and answers to their questions. I am going to step in and become a voice of reason to many of you. Some of you will be taken aback with my candid suggestions, but upon this new perspective, most of you will come to the same conclusion that I have. I have been working on RV's as long as I have been working on cars and boats; they are not the same and my tips come from dealing with hundreds of RV's and RV owners. 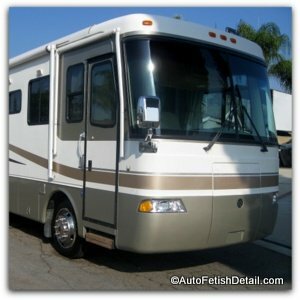 These are the most common as they start at entry level pricing and continue towards the higher-end RV's with full paint. Mostly white; sometimes cream colored. Usually have some form of decal striping, lettering, etc. May also have limited use of paint such as the bottom half or stripes applied with paint. Fiberglass/Gelcoat becomes hazy, uneven, and chalky over time. Corrugated RV's can be smooth sided or texture corrugation. Are usually white, but can be any color ultimately. Usually have many vinyl decal stripes and lettering. These are the easiest to wash, wax, and detail. These are also the most expensive; which is why they are less common than the other types of RV's. These are rare and nowadays only represent the Air Stream line-up of trailers. Older models are bare aluminum and can be polished. All new models have a clear-coat applied over the aluminum and can be maintained like any car paint. 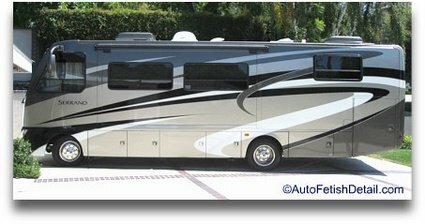 This class A motorhome represents the majority of RV's on the road. With that said, RV's come in hundreds of configurations and this one is fiberglass/gelcoat with paint and vinyl graphics. The white sections represent the fiberglass/gelcoat, the bottom section is paint, and all the individual stripes are vinyl decals. Any form of car wax, RV wax, or marine wax can be used on the bottom, painted section. The fiberglass/gelcoat sections will become dull, hazy, and chalky over time. Unless your RV is in pristine condition with no forms of oxidation, you will require the use of some form of RV wax with either chemical cleaners or abrasive cleaners that have the ability to remove the oxidation. You can either remove the oxidation first with an individual product, or you can use a RV cleaner wax and accomplish 2 steps in one. Called marine or boat wax since it is formulated for fiberglass/gelcoat which is what your RV is. I recommend a cleaner wax for every fiberglass/gelcoat RV or boat since fiberglass/gel coat oxidizes so easily even when they are kept indoors and appear to be in mint condition. The cleaners will remove trace amounts of oxidation you likely don't realize is even there until you try and wax your RV or boat. Same explanation as above regarding the use of a cleaner wax for your RV despite how great of condition it is in. This is a separate and dedicated compound ideally suited for RV's with moderate to heavy levels of oxidation. Follow up with one of the cleaner waxes above to finish your job (yes; even though you have just used a heavy compound, I still recommend a cleaner wax as your last step in enhancement and protection. For those of you really dedicated to getting the best results. Each step of the process has a dedicated product for use. The compound in this kit is not as aggressive as the Meguiar's #67 above, but is still considered an aggressive compound. they are entirely different and working on them, maintaining them, doing anything with gelcoat/fiberglass is very different than dealing with car paint. If you are ever questioning as to which is better to maintain and deal with when it comes to RV's in any configuration, I will take a fully paint RV any day of the week! Car paint is not fiberglass or gelcoat. When waxing or polishing, keep in mind that gelcaot/fiberglass is what I call an unstable material. This means after you have waxed or polished a section, it will appear perfectly uniform in appearance from one direction, but blotchy from a different direction or lighting; this is part of that "nature of the best" I was referring to. When using RV wax, boat wax, RV polish, etc., it will require more work, more passes, more pressure, more of everything if you are making a natural connection to working on car paint; it really is a different animal. Gelcoat and fiberglass is a very durable material and very forgiving...so if you have been looking for an excuse to buy a professional buffer and finally learn how to do car polishing, boat polishing or RV polishing, then this is the good news. It is harder work than that of car paint, but it is almost impossible to screw anything up...and I am referring to using a rotary, or high-speed buffer which is what I strongly recommend. A DA, dual-action, random orbital, etc., can be used when applying RV wax, RV polish, etc., but because fiberglass and gelcoat is such a tough and durable material, it really is deserving of the higher speeds and friction that can only be created with a rotary buffer like the one from DeWalt above. Hopefully I have offered additional insight into not only your RV, but in choosing an RV wax that will actually produce more of the desired results you are after. I know the majority of guys (and gals) that visit my site are looking for useful tips for cosmetic car care. I realize that many of you would also like a reliable resource online when it comes to mechanical repairs and service of your RV. It can be much easier and far less expensive to repair your RV yourself, or to at least get a diagnosis from an expert before heading to the repair shop. The Automotive Experts on JustAnswer can answer questions, diagnose problems and guide you through any repairs you want to make yourself, any time day or night, for literally any make, model or age of an RV. Simply start typing your question into the "Ask a Mechanic Now" directly above and see what can be done for you!